How to fix MSVCR120.dll is missing error on Windows? Home »	Fix » How to fix MSVCR120.dll is missing error on Windows? Issue: How to fix MSVCR120.dll is missing error on Windows? I cannot open a video editing program because of MSVCR120.dll is missing error. I am not sure how to download this file. Can you help me? MSVCR120.dll is missing is one of many Windows errors that warn about issues with Dynamic Link Library file (DLL). These files are responsible for specific operations that can be shared among different programs. However, we want to stress out that installing a single MSVCR120.dll is not a way to get rid of the error and launch a needed program. This might lead to even more damage to the system or installation of malware. DLL files spread together with programs. In this case, it spreads with Visual C++ Redistributable Package. Hence, one of the methods to get rid of the error can be the reinstallation of the whole package. 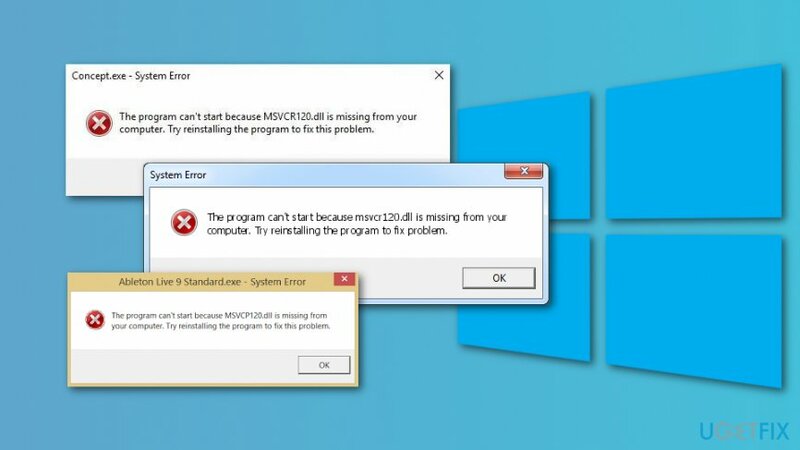 In some cases, the “The program can’t start because MSVCR120.dll is missing from your computer” error is triggered by corrupted system files, Windows images or malware attack. Below you can find methods that should help to solve the issue. The first thing you need to do once you receive an MSVCR120.dll is missing error is to check the Recycle Bin. You may have intentionally or unintentionally deleted this file. Hence, if you find it, right-click this entry and choose Restore option. However, if it’s not there, you have to take extra measures. We have provided a list of possible methods that should help to fix “The program can’t start because MSVCR120.dll is missing from your computer” error. The error identifies the problem with MSVCR120.dll file which belongs to Visual C ++ Redistributable Package. 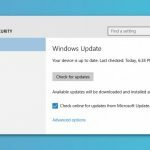 The issues can be fixed by reinstalling this Microsoft page from the official website. Based on your system type, start the download of the vc_redist.x64.exe or vc_redist.x84.exe file. When the download is over, close all the programs and double-click the file. Another method to fix MSVCR120.dll is missing error on Windows is to reinstall the program that was in used when you received an error. Type run in the Windows search box and open Run program. 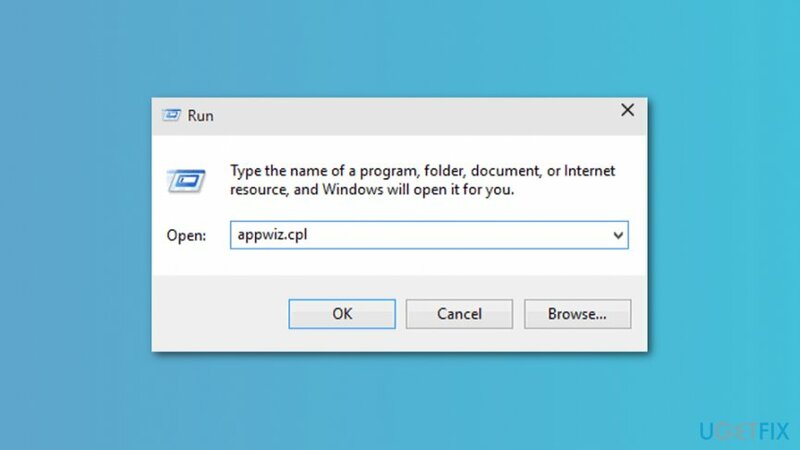 In the Run window, type appwiz.cpl and click Enter. In the appeared Programs and Features window, find the troublesome programs. Right-click it and choose Uninstall from the menu. Restart the computer if needed and download the same program again. Find Command Prompt in the results list, right-click it and choose Run as administrator. In the Command Prompt type sfc /scannow command and click Enter. Wait until the command is executed to see if some problems were detected and fixed. Start Command Prompt as administrator as explained in the previous method. In the Command Prompt type DISM /Online /Cleanup-Image /RestoreHealth command and click Enter. If any issues with Windows images is detected and fixed, you will see this information after the scan. In the Windows search box, type Check for updates. Click on the first appeared result called Check for updates. You will be redirected to Windows Update settings. Click Check for updates button. 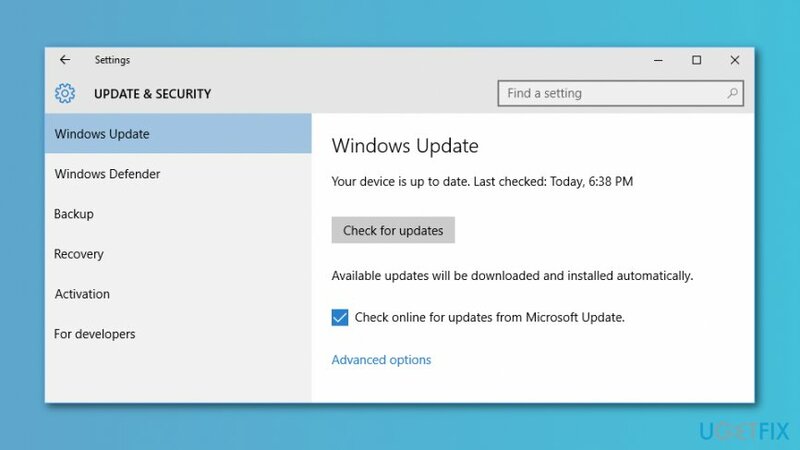 When Windows displays available updates, install them and check if the error is gone. If none of the methods mentioned above helped to fix MSVCR120.dll error, you should check if your computer is not infected with a virus. Various cyber threats might cause system changes that result in error messages. 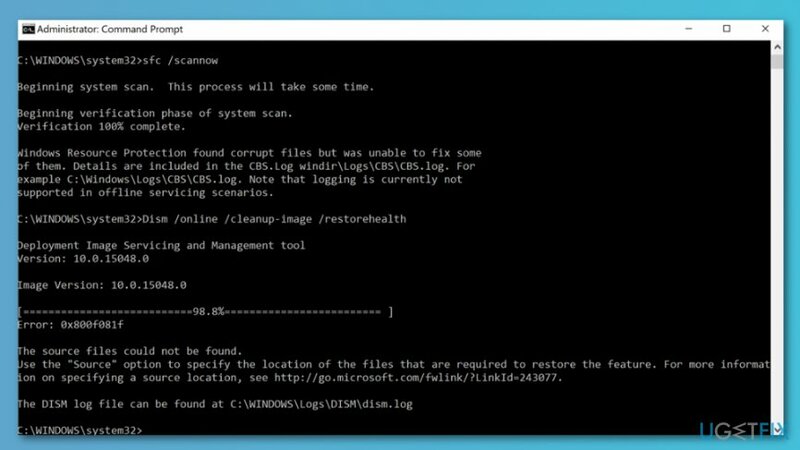 Hence, scan your Windows machine with Reimage or your preferred security software to check your computer’s state. 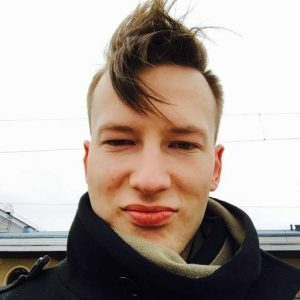 ^ Dynamic-link library. Wikipedia. The free encyclopedia. ^ Andre Da Costa. 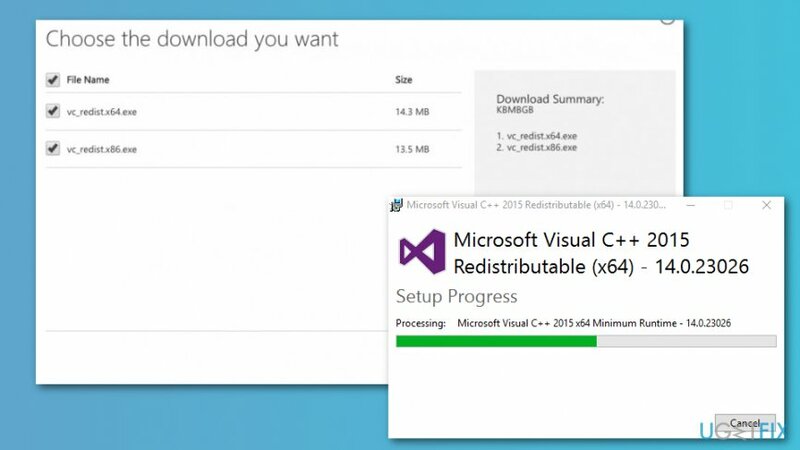 What is the Visual C++ Redistributable? How to Install and Troubleshoot It on Windows 10. groovyPost. Tech news, reviews, privacy editorial, tips, and the best how to galleries . ^ Tim Fisher. 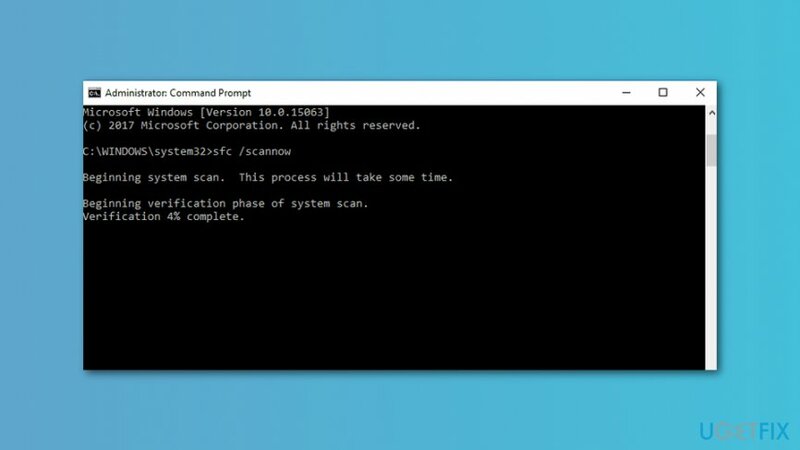 How to Use SFC /Scannow to Repair Windows System Files. Lifewire. Tech how-to guides and tutorials. ^ Mauro Huculak. 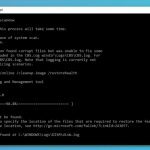 How to use DISM command-line utility to repair a Windows 10 image. Windows Central. News, reviews, help & tips, buyer guides, forums and accessories.